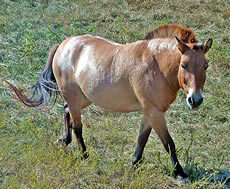 Also called the Asian wild horse, Przewalski's wild horse is found in the Altai Mountains of Mongolia. This species may be extinct and is the only true wild horse since it is the only surviving horse species that has never been domesticated. It is a small, stocky horse similar in appearance to a pony, and adults only reach about four feet tall. Head and body length is about seven feet, and weight ranges from 440 and 660 lbs. Its coat is sandy-colored and becomes lighter and longer in the winter months, and it has a short erect mane that is darker in color. The legs are also darker in color with faint stripes and one dark stripe own the back. Przewalski's horses are found in grassy deserts and plains, and they were once found at elevations as high as 8000 feet. More than half of the day is spend foraging for food, and then they travel to graze and watering areas after sun-down. Herds are formed with one dominate stallion defending the group. When the younger males are old enough to mate, they are ejected from the herd. There are also female "leaders" that are in charge of guiding the herd while grazing. Diet consists of grass, plants, and fruit. They will also eat bark, leaves, and buds. Mating occurs between April and May, and females give birth to one foal after an eleven to twelve month gestation period. The young foal is able to stand and walk within the same hour of its birth. This species was once hunted for its meat and has lost much of its natural habitat to grazing domestic animals. The last true wild horse was seen in 1968, and it may be extinct. Many of the remaining horses are found in zoos although they have lost some of their distinct features due to cross breeding and domestication. Some of these breeds were reintroduced into Mongolian national parks, and in 2005, the wild population was estimated at about 300 animals. Copyright Notice: This article is licensed under the GNU Free Documentation License. It uses material from the Wikipedia article "Przewalski's horse". Glenn, C. R. 2006. "Earth's Endangered Creatures - Przewalski's Horse Facts" (Online). Accessed 4/23/2019 at http://earthsendangered.com/profile.asp?sp=194&ID=3. Need more Przewalski's Horse facts?